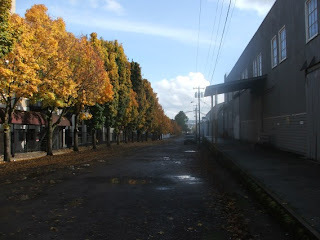 On our wanderings around Portland we drove down to the industrial area of Portland to find Great Harvest Bread Company, The former Freeman Baler factory and to see where my brother drives around with a 50 foot belt trailer. We did find the Freeman Baler Company on Nikoli or Yeon or where ever it was. Here is a photo of the old headquarters. And here are the loading docks. They have a whole block of buildings. 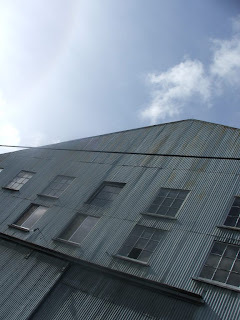 It was one of those old rambling factories and was probably pretty inefficient. Going to J.A. Freeman and Sons was always an adventure in my younger years. Sometimes we got a tour. The goal was to get a free hat (for me) and a calendar for Mom. The office had an oak counter and oak desks. There were framed blueprints on the wall. There were old and kind of grumpy people around. The Freeman baler itself was kind of unusual. The basic design was really unchanged from the very first stationary balers. It had large bullgears which drove a heavy plunger at fairly low speed. (75-85 strokes per minute) The whole baler was very heavy and it appear to be mostly fabricated by hand. We have two model 200 balers with which we used to make 85lb wheat straw bales at below 16 percent moisture. That it making a bale so tight that if a string breaks they explode. The company was bought by Allied Systems a few years ago and moved from North East Portland to an industrial park somewhere. Of course they screwed all their old dealers in the modern AGCO tradition and Freeman baler sales came to a complete standstill in our area. In fact, I bought a Hesston 3-tie and we sold our 3-tie Freeman because we couldn't get parts. The fact that I, the owner of Minneapolis-Moline tractors, a Studebaker car, a Triumph motorcycle, and Mac computers actually switched brands should be an object of study by classes in salesmanship world wide. It appears that they are still being made. I would like to have two new 2-tie balers as that seems to be where the market is going, but I will probably buy New Holland balers as I don't want to deal with the local John Deere dealer who is the local Freeman dealer and who is trying to bury the brand. Sad to see the old names and companies that we grew up with now disappearing. But the world is changing and I guess we either adapt or get left on the sidelines. Toyin, thanks for visiting. I would like to know specifically what you found interesting. You have a very informative blog. Ralph, I'm opting for the get left on the sidelines approach. I think the sidelines people are nicer and more interesting. I always wanted to go get a tour of the Freeman plant. I guess I waited too long. I've heard that in the old days, if you got in a pinch for parts on a weekend or at night Mr. Freeman would personally come down to the factory and give you what you needed. Companies like that are fading fast. Local JD dealer has started taking Saturdays off. Now, I thought the reason they changed the name from "Implement Co." to "Farm and Lawn" was to court the homeowner/small acreage folks. So isn't the best time for those folks to come in on Saturday. Hmmm.....lost revenue! Oh well, now they will just jack parts prices up a bit higher to make it up. Modern business theory is complete and utter bullcrap. J.A. Freeman and Sons were pretty much old school. Back when American was a real country. Really a shame to see it all fall apart. The local JD dealer is an example of what is wrong with the regional dealer concept that has taken over the agricultural world. Very frustrating! Don't be too hard on Lane County. At least their are some sensible farmers and loggers there. Portland and Multnomah county is the worst. Hey, I resent that! I'm in Benton County but with all the OSU folks it's just as bad. I think I'm going to try to get a bill introduced in the next session so that ballots for statewide measures and candidates are only sent to Multnomah and Lane counties. It would be better to KNOW that we have no voice than to occasionally be deluded into thinking that we do. Voting as a conservative in this state and this county is a total waste of time IMO. I did see that Susan Sokol Blosser was defeated. Thanks for your comments. Wonderful to hear from someone who worked there. I understand people lived in the neighborhood and walked to work. I've been given tours of the factory by Freeman family members. I hated to see it go. The last of the old companies. Allied is not the same company. However, it is no longer the same world, farming is different, steel is expensive, I guess it all has to end sometime. Yes, the parts manager Larry, his son David and I all live within a few blocks from the old building. I could see it from my kitchen window and would always see Larry walking down at night to grab parts or see Percy there in the middle of the night. We bought a whole bunch of the old wood shelves when you were closing up. Back in the 50's they were king of the alfalfa fields but hell on teen age bale pickers . ha ha ha. I could only imagine. I bucked hay for my grandad on his ranch down in Roseburg and thankfully it was not alfalfa. Couldn't imagine getting those bales up in the loft of his barn. When I joined the Navy we had to buck bales of rags up to the 03 level and remember the city boys whinning about how heavy they were. We just laughed at them as they were not that heavy. Grew up in eastern WA and will always remember the sound those old balers made. Still have an old 25a that we make 600 or so bales every summer. used to make a lot more and put them in sheds using a Freeman elevator. Just found an old freeman rain guage. new in the box. Bob, I know what you mean about the sound of a Freeman. If I close my eyes I can hear it and then I start counting strokes and waiting for the click of the needle cycle. Or the bang of the shear pin breaking. I know there are 25A parts still on the shelf at Lehman Farm Supply LLC. (503-835-3777) Plus two Freeman 200's in the pasture and a couple 25A's down below the hill. Good to hear people still talking about Freeman Balers. I was recently in a grocery store (McKays) in Lakeside, Oregon and saw an old Freeman cardboard baller still in use! Made me feel a little sad thinking about everybody who used to work in the plant. The Death of Freeman is a good example of the death of classic American Farming. Fewer farmers buy fewer pieces of farm equipment and farming is about delivery of product and overseas markets. Terrific to read you guys writing freely about Freeman Balers. Only a handful of them ever came here to Australia and I've never seen one operate. My partner and I are making a trip to the U.S. next August/September (2019) to continue my researching and planning for a book on the History of Hay Presses and Hay Balers across the world. We had a great time of it last year at New Holland and Ann Arbor (Michigan). Freeman is high on my list of balers tom learn more about. I have my 'Little Library' which has good coverage of most of the company's balers from 1960 on. Before that things are pretty thin. We expect to be in Portland in the last week in August, 2019. Who should I speak to? Who has the archives from the company? Would love to see the two (unused!!) 25As 'buddeshepherd' speaks about. Anything anyone can tell me to get me in the right direction, I'd greatly appreciate. 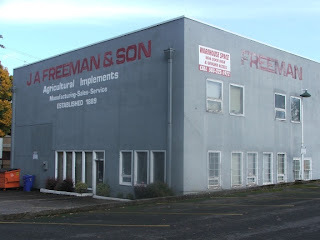 I think Freeman were the first company in the U.S. to build automatic tying 3-tie balers and the first to build self-propelleds (If you don't count the Ann Arbor's that company would fix to a truck chassis for you if you provided the truck; mid-1930s). Freeman is therefore as significant a baler company as New Holland... ... and they were/are pretty significant! Great to read the conversation about Freeman and their balers. It's sad they've changed owners and shifted house. The brand lives on though which is terrific. Freeman built the first automatic 3-tying balers and the first self-propelleds in the U.S. My partner and I are visiting Portland, Oregon next August (2019) to try to find out more about the history of the Freeman Company. I'm preparing a book on the history of hay presses/hay balers and Freeman will have a significant place in it. Who should we speak to?... ... Where are the company's archives? Any direction any of you good people could give me on this will be greatly appreciated. As of a couple weeks ago, they have completely renovated the two Freeman buildings in Portland next to Montgomery Park and paved the street. All evidence of AG Freeman looks to be gone. I must say that it had become run down and in need of a better life, so the changes are positive. Where did the Real America go? What sort of winter will we have?